Americans involved in starting a new business at any given time. Determining the difference between a viable business dream and a nightmare. Personal doubts, hopes, goals, self-talk and fears. Investment, saving, insurance and tithing issues. Responding to valid and/or “uncalled-for” criticism from family and friends. 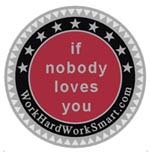 Personal work ethic. Challenging the extremes, like workaholism and laziness. Learning how to work both hard and smart. Long hours, stress and family relationships…especially during the first few ramp-up years of any business venture. The development and on-going care of business partnerships. Knowing what questions to ask when researching business models and legal issues. Embracing the purpose of business. Taking time to count the many blessings – gratitude for the skills, abilities and relationships necessary for the development of a successful business. Developing group and personal definitions of success that are motivated by values that will still be important many years from now. The soft cover edition is available online and everywhere through Authentic Publishing (ISBN: 978-1-932805-98-7). Picture this: Your company, school or organization's logo is on the left-hand corner of the front cover of this book. The first couple of pages in the front and back are filled with whatever you want to communicate about your organization. Our publisher is permitting a limited number of "private label" editions of this book, which can be used as an outreach marketing tool for your organization -- giveaway or fundraiser. Translated editions of the book are permitted. For schools and non-profits, corporate sponsorship is an alternative. The publisher is willing to place a few ads for the primary companies that are financially backing your special edition. The ads can be placed on the back pages, plus 1-2 of the primary sponsoring companies can have their names near your logo on the front cover -- which can pay for the entire edition. Everyone wins! Minimum order is 2,500 copies. Affordable. Purpose: The entrepreneurial journey provides a wonderful gateway for Connecting Now With Later. "What do you want to do the rest of your life?" is a question that some respond to immediately, while others are quite sure yet. Once an individual has developed a direction...character development, personal accountability, flexibility, core values, ethics, perseverance and a sense of humor are some of the topics that emerge as important concepts to be considered. View yourself as a coach. Facilitation is an art – designed to develop a group dialogue, with the facilitator stepping forward if the conversation is getting off-track or needs to go to a deeper level. Ask open-ended questions that foster more than “yes” or “no” responses. Use ice-breakers at the beginning of some meetings. Example: “Two Truths and an Exaggeration” – Each person in the group shares two real events that happened in his or her life, along with one fanciful story. “I once met the actor, Denzel Washington, on the street and he stopped to talk with me for 2-3 minutes. When I was 13 years of age I spent a summer on a farm in South Carolina with my uncle. I swam competitively in the freestyle competition and came in second when I was 11 years of age and was in the top swimmers in the State.” The group then determines which one of the three stories is not true about the person. This is an engaging way for people to get to know each other, having a bit of fun while doing so. * Another ice-breaker: The "Ah and "Um" Game -- Give a 20 second overview of your business for 20 seconds without saying "ah" or "um." It's very hard for, ah, most people to, um, do. Some groups have at least one person who loves to talk and who is adept at high jacking the evening by introducing topics that have nothing to do with the subject matter of the evening. There are also some hyper-needy individuals who are like bottomless pits, pulling everyone’s focus in his or her direction. Be aware of these types of personalities and develop a strategy for keeping the meeting moving in a productive direction. Respect the schedules of the Next Generation participants by always starting the meetings on time and ending on time. Chairs in a circle may work the best until the meeting gets too large. Each week it might be good to have someone communicate for 3-5 minutes on, “My biggest mistake and what I learned from it” or something like that. Be creative with the topics. The individual then gets to pick the next person to talk the next week. i. Start with greeting everyone. 3 minutes. ii. Personal “laser-introductions” of all the participants (e.g. name, what business you are building, number of years in business, and what brought you to this meeting today.) 60 – 90 seconds for each person (depends on the number of people in the group). iii. Have someone communicate on “My biggest mistake and what I learned from it” or something like that. That person then selects the person who will share next week. 3-5 minutes. iv. Read the chapter of the book out loud together. This can be accomplished by one person or by having each person read one paragraph until it is finished. 10 minutes. v. Break up into small groups by having everyone count “1,2,3,1,2,3,1,2,3” until all have an assigned number. Each of the three groups go to separate parts of the room or another room to discuss the questions of the workbook. Each group appoints a leader whose job it is to make sure that the group keeps on schedule and then to report back to the whole group. 20-30 minutes. viii. Close out with some affirmations and encouragement – cookies, coffee and soda provide an opportunity for some to hang around for a while and talk if they want. Groups function best with questions that help them observe, interpret, and apply what they are learning. The questions should be forthright enough to allow each person to take a turn as moderator, moving the group paragraph by paragraph through a chapter. The facilitator must not assume that everyone understands the material covered. 1. Confine the discussion to the chapter being studied. This keeps the newcomers at equal advantage. As the weeks go by, of course, everyone's scope of knowledge enlarges, and the group is able to refer back to chapters previously studied. 2. Expect everyone to be responsible for pulling the group back from digressions. The facilitator’s job is greatly eased if others in the group help say, "We've gotten onto a tangent. Let's get back to the chapter." These guidelines keep a group focused. Because small businesses are the direct extension of individuals, personal matters are brought forward to the group. If there is to be the expectation of honesty, there must be a pledge of absolute confidentiality among the members of the group. Trust, emotional safety and mutual respect are the foundational building block. No one will use put-downs or personal attacks. Each person has two ears and one mouth. Listen carefully before speaking. Earn the right to be heard. The meetings are for networking, but trying to recruit other participants into a network marketing business is discouraged. The NGEC meetings are designed to be an emotionally safe place for people to sometimes share what others may perceive as an off-the-wall entrepreneurial idea. Judgments are not to be a part of these meetings. Treat others the way you want to be treated. Meetings will start on time and will end on time. Participants are encouraged to talk afterwards, if they want. Dr. Freeman, I find it appropriate to write you from the most humbling place I have ever been. I'm not exactly sure why, but who am I to argue with the wind. I've recently decided to commit to exploring life on different terms by changing my beliefs and accepting certain struggles with open arms and mind. I find it necessary to thank you for bringing comfort along the way. I am now two months away from release in a correctional facility. I was given the gift of life through incarceration. After several years of trafficking marijuana, the last two while struggling with a deadly addiction of painkillers, I was finally forcefully removed from my lifestyle and given an opportunity to reflect. It wasn’t until two months ago that I committed to walking away from the temptation of fast living and find comfort in sacrifice and struggle. I'll save you the dramatics involving my journey to this point because I believe my struggle has been trivial compared to others that go unnoticed or are seen but never spoken of. I've always had the ability to find comfort and support from my loving family, I simply chose not to. The mistakes I made revolved around my believing success in life was measured by other people's perception of one's monetary value, not by the satisfaction one feels from being content with life itself. I now have found a new approach to life and holding myself to a higher standard as a person. For the last year I've been concentrating on a project to keep myself busy during my stay and following my release. My love of creating and enjoying all forms of music has inspired me to address several issues I've found to be problematic, both as an independent in the industry and a patron of others. My goal is simply to empower other independents by providing direction through knowledge and resources using a web based network – eliminating unnecessary middlemen and expenses along the way. 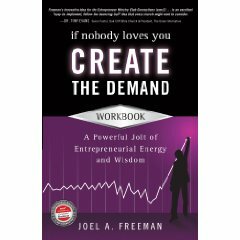 While attempting to better my knowledge and approach towards my goal, I received a copy of If Nobody Loves You, Create The Demand with my normal regimen of materials. 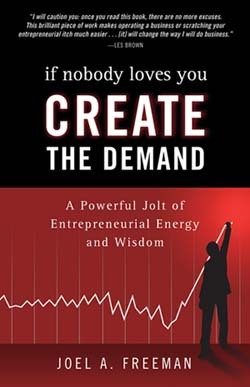 I began reading strictly from an entrepreneurial perspective; I finished reading as an adoring admirer, morally obligated to make a better effort in my way of life. I've never felt it more important to shy away from the dangerously easy way of obtaining money than I did as I finished your work. To say why, I'm without a definitive answer. I'm fairly certain you weren't writing to show convicted drug addicts how to embrace struggle and sacrifice while struggling to sacrifice. But, I also believe you'll appreciate knowing you have not only reached someone in my position, but potentially saved them as well. I am 28 and have never been so positively influenced by another individual's work. I believe I owe you much more than the cost of your book. I've waited a short period of time to write this letter in order to be sure my feelings are genuine. I keep your book where I can see it daily and make mention of it to others frequently. My father is helping me with my project and had this book sent in. He has been told that that we will one day use your professional services to benefit our team. I tell myself one day I'll be able to shake your hand and ask if you remember the letter you received from a prison. At that time, if I have not met my goals, I will tell you how much just having a goal is worth to me. Sir, I thank you for the comfort and confidence you have provided me during this transition in my life. Please don't be surprised or feel obligated to respond if I send you an occasional update while I attempt to make a something from a whole lot of nothing. Panel display, tablecloths, display screen and display shop. "entrepreneur club -- audio book -- MP3 player -- Ipod -- TalkSwitch"